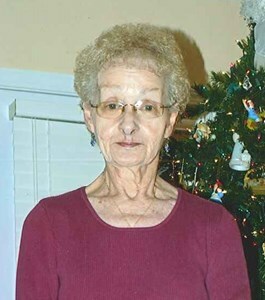 Shirley Houtchens, 80, of Louisville, Kentucky, passed away peacefully Friday, April 12, 2019. Shirley was a devoted wife, mother, grandmother, and aunt. She fiercely loved her family with all of her heart, and thoroughly enjoyed spending any amount of time with them. Her family was her pride and joy. She was an avid coffee drinker, shopper, and relied on her unwavering faith. Some of Shirley's fondest memories were working Millionaires Row at the Kentucky Derby. She was born on March 29, 1939 in Jefferson County, Kentucky to James and Bertha Riggs. She is preceded in death by her parents, her first loving husband Harold Wallace, and her second loving husband George W. Houtchens, Jr.
Shirley is survived by her loving daughter, LeDonya (Scott) Derbacher, sons, Harold (Sheri) Wallace, George (Cynthia) Houtchens, grand daughters, Ashley Wallace, Shelbie Wallace, and Natalie Houtchens. She also leaves behind several nieces and nephews. Visitation will be from 4:00 pm to 8:00 pm on Wednesday, April 17, 2019 at Newcomer Cremations, Funerals & Receptions - Southwest Louisville Chapel, (10304 Dixie Hwy). Her Funeral Service will be at 1:00 pm on Thursday, at Newcomer Cremations, Funerals & Receptions - Southwest Louisville Chapel with burial to follow at Louisville Memorial Gardens West. The family requests that contributions in Shirley’s memory be made to Hosparus of Louisville. Add your memories to the guest book of Shirley Houtchens. Shirley was such a wonderful person. She will be so deeply missed. Keeping you all in thoughts and prayer. My deepest sympathies for your loss. I am praying that God flood your memories with wonderful times and days. Phillip and I are lifting you and your family in prayer. So sorry to hear of the passing of Shirley. I counted her as one of my friends for the last 40 years. She always had a glass of tea for me and a friendly ear to listen. We were 15 years apart but you never would have known it, Shirley had such a young heart. I will miss her and my prayers are with Harold,. LaDonya, & Chip.